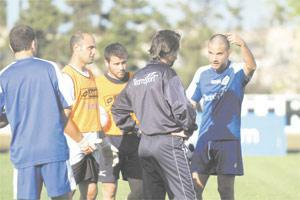 Coach Oliver Spiteri (centre) talking to striker Andre Schembri during training. Their confidence enhanced by a strong finish to the 2005-2006 league trek, Marsaxlokk will seek to enhance their growing pedigree with a positive showing in the UEFA Intertoto Cup. Marsaxlokk kick off their European adventure this evening when they take on Bosnia's NK Zrinjski in Mostar (kick-off 7 p.m.). The Maltese team's preparations for what will be only their second participation in European competitions are being led promising coach Oliver Spiteri. For the best part of last season, Spiteri worked hand-in-hand with the experienced Ray 'Zazu' Farrugia at Marsaxlokk but the former St Patrick and Birkirkara midfielder has assumed sole charge of the team for the summer competition. Marsaxlokk have already announced that Brian Talbot, the former Hibs coach, will lead their team next season but this did not dissuade the enthusiastic Spiteri from taking on the challenge of guiding the team in the Intertoto Cup. Spiteri will have an all-Maltese team in Bosnia after Marsaxlokk decided not to renew the contracts of Portuguese defender Nuno Gomes and Wendell Gomes, the Brazilian forward. With Intertoto Cup rules precluding clubs from using players who had not formed part of the squad last season, Marsaxlokk could not recruit new players. On the plus side, David Camilleri and Daniel Bogdanovic, who were loaned out to Hibernians and Sliema Wanderers respectively, are back at Marsaxlokk and both are eligible to don the blue shirt against NK Zrinjski. Confirmation of Marsaxlokk's participation in the Intertoto Cup virtually lengthened their 2005-2006 season by another month. "The players who are not in the national squad had a two-week break before we began preparations for the Intertoto Cup," Spiteri told The Times before Marsaxlokk's departure to Bosnia and Herzegovina on Thursday. "Fitness-wise, the players are in a good shape, thanks mainly to the physical work they did last season." NK Zrinjski were also back on the training pitch earlier than usual after their third-place finish in the Bosnian league handed them a berth in the Intertoto Cup. Third place in the 16-team division represents a drop in standards by Zrinjski who won the championship the year before. Coach Blaz Sliskovic has already made it clear that regaining the Bosnian league is Zrinjski's priority, telling uefa.com: "We want to get through our first two games in the Intertoto Cup and prepare well in order to win the league title again." Spiteri is well aware that Marsaxlokk face an arduous task to overcome Zrinjski over two legs. "The standard of football in ex-Yugoslav countries is high and Zrinjski being one of the top teams in Bosnia, they will surely be tough clients for us," Spiteri said. "Although I appreciate the difficulty of the task awaiting my team, I'm optimistic that Marsaxlokk can give a good performance in this competition. Given that we're playing the first leg away, it's crucial that we gain a respectable result in Bosnia to keep the qualification issue alive." The absence of foreign players from Marsaxlokk's ranks and Trevor Templeman's lengthy recovery from the ankle injury he suffered in February have left Spiteri with only 15 fit players to choose from. The decision to severe links with Nuno Gomes and Wendell Gomes before their Intertoto Cup duties put a strain on Marsaxlokk's resources. "We have lost Nuno Gomes and Wendell Gomes. They were valid players but their absence has been compensated for by the return of Bogdanovic and Camilleri," Spiteri said. After this evening's game in Mostar, the second leg between Marsaxlokk and NK Zrinjski will be played at the Hibs Ground tomorrow week at 10 a.m.
R. Debono, K. Sammut, S. Wellman, C. Magro, C. Mamo, G. Sciberras, J. Pace, C. Frendo, D. Bogdanovic, S. Bajada, A. Schembri. Under a new format, three rounds will be played in the 2006 Intertoto Cup, instead of five. The 11 winners from the third round will go through to the second qualifying round of the UEFA Cup. All 49 UEFA members will be represented except Italy. They withdrew their teams from this competition this year. Before, teams played five rounds, with three final winners progressing to the UEFA Cup first round. The seeded teams in the third round so far are: Villarreal (Spain), Marseille (France), Hertha Berlin (Germany), Newcastle (England), KAA Gent (Belgium) and FC Twente (Holland). If Michael Mifsud's Lillestrom win their second round match, against Keflavik or Dungannon, they play Newcastle United for a place in the UEFA Cup.